True life heroes are hard to come by these days. I’m sure real heroes are out there, especially in our military and our police force and firefighters. But, the real heroes are overshadowed by the showy, superficial heroes that we tend to glamorize in Hollywood and in the Sports World. Sure, some of these men and women are amazingly talented at what they do, but who are they when the cameras are turned off and the crowds of adoring fans have gone home? Too often today’s heroes end up in trouble for making bad choices, or even worse, they make bad choices and we all chuckle and say it’s part of their “bad boy” or “bad girl” image. Unfortunately, these less-than-true heroes are the ones that far too many of our kids are idolizing. Wouldn’t it be great if our society began to turn the spotlight toward men and women who deserve to be called heroes? That brings me to 7 Men by Eric Metaxas. 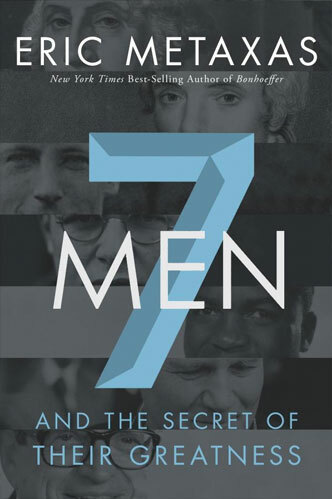 I thoroughly enjoyed this collection of seven biographies about 7 exceptional men. Men who fit the description of a true hero because their lives, though not perfect, were defined by self-sacrificing for the good of others, and each gained his strength and inspiration from the God of the Bible. George Washington – It was his faith in God that made him the great Military and Political leader that he was. At least twice he turned down great power and wealth because he knew the newly liberated United States of America was God’s country and not his own. William Wilberforce – He was a brilliant and gifted orator and politician who, when confronted with the truth of Christianity, had no choice but to re-direct his whole life toward fighting for the improvement of humanity. Not only did he champion the cause of slavery, but he was also instrumental in bringing reform to many other areas of human suffering. Eric Liddell – He is famous for choosing to not run the 100 meter race in the 1924 Olympics because it was held on a Sunday. A few days later he won the 400 meter race, as depicted in the movie Chariots of Fire. His story, however, did not end there. In fact it was just beginning. He went on to become a missionary to Communist China where he and his family lived through many more dramatic and miraculous events. Dietrich Bonhoeffer – He was a Protestant pastor during the time of Nazi Germany whose faith in Jesus Christ would not allow him to cooperate with the Nazis as they exterminated their Jewish citizens. Even in the face of imprisonment and eventual death, Bonhoeffer continued to teach others that the true God valued every human life no matter their nationality, color or physical condition. Jackie Robinson – He was a man who endured incredible racial prejudice and persecution as he broke the color barrier in professional baseball. His strong faith in Jesus coupled with his extreme physical talents brought him through it all with flying colors. Pope John Paul II – He was the first Pope to come down from his holy pedestal so that he could minister to his followers at their level. His intention was not to weaken his own authority but rather to show love to his flock much like Jesus Christ himself did. Chuck Colson – Many thought the Watergate scandal was the end for Chuck Colson just as it was for his boss, Richard Nixon. Chuck, however, found Jesus when he hit bottom in a federal penitentiary. It was there that Chuck Colson found his new calling; a ministry to care for and disciple prisoners. For more information on author, Eric Metaxas go here. To see 7 Men on Amazon.com, go here.